(P1) Martin Shkreli, the boyish entrepreneur who caused a public UPROAR after he DRASTICALLY raised the price of a life-saving PRESCRIPTION DRUG, was arrested on Thursday for engaging in what U.S. prosecutors said was a PONZI SCHEME at his former HEDGE FUND and a PHARAMACEUTICAL company he previously headed. 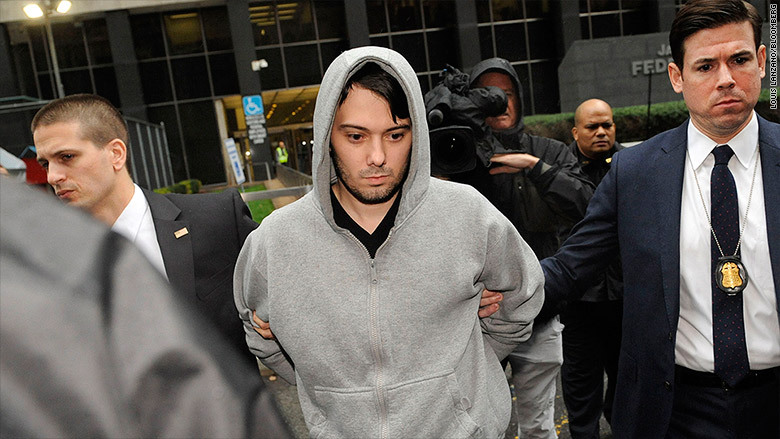 (P2) Shkreli, who has become a LIGHTNING ROD for growing OUTRAGE over SOARING prescription drug prices, was arrested before dawn in midtown Manhattan. Dressed in a grey hoodie, the 32-year old could be seen being led by LAW ENFORCEMENT officials. (P3) It was a dramatic TURN OF EVENTS for Shkreli, who in recent months became a PARIAH for his controversial remarks in the press and on social media outlets. (P4) Many on social media said Shkreli was getting what he deserved. A feeling of SCHADENFREUDE was WIDESPREAD. But Shkreli’s DOWNFALL was not related to expensive drug pricing. (P5) Shkreli, who is currently CEO of Turing Pharmaceuticals and KaloBios Pharmaceuticals, was charged in a federal INDICTMENT relating to his management of hedge fund MSMB Capital Management and bio-pharmaceutical company Retrophin Inc.
(P7) Authorities HIGHLIGHTED what they called the “BRAZENNESS” of his actions. Shkreli’s efforts to conceal the FRAUD led him to use the assets of Retrophin to pay off debts from his hedge funds, Capers said. (P8) Shkreli was charged with fraud and CONSPIRACY. The maximum sentence for the top count is 20 years in prison. (P9) “Mr. Shkreli is confident that he will be cleared of all charges,” his representative said. (P10) The indictment, the result of an ONGOING investigation, also charged Evan Greebel, a former partner at law firm Katten Muchin Rosenman who was Retrophin’s OUTSIDE COUNSEL. Greebel, 42, was also arrested on Thursday. (P11) Shkreli and Greebel entered PLEAS of NOT GUILTY through their lawyers. (P12) Shkreli went home after posting $5 million in BAIL. (P13) The securities fraud investigation PREDATED a separate controversy surrounding Shkreli since September, when he raised the price of the prescription drug Daraprim from $13.50 to $750 a tablet. Why is this BRASH young CEO so widely disliked? The word “Schadenfreude” is one of many words in English that come directly from another language (in this case German) without any ALTERATION. Why do you think the English language has borrowed so many words? How did English people come into contact with so many languages? Has anyone in your family ever needed to take a prescription drug on a regular basis for their health? Why are accused criminals required to post bail in order to be released before trial? What happens if they don’t post bail?